There is a lovely place in Knitsville called The Yarn Barn. It is filled with fiber. Mostly acrylic but every once in a while there is a lovely wool blend, even some silk and camel’s hair. But mostly acrylic. It used to be quite organized but it no longer is. Marie Kondo would jump for joy at the sight of this room in our house. 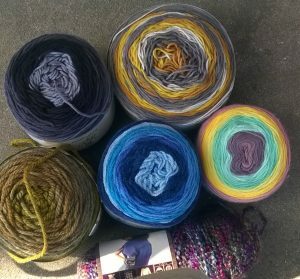 I have more yarn than I can use in a year. I think I could go a couple or three years using one ball a day before I would run out. Even so, I still have to pull myself back from buying more. I love the stuff. I like looking at and thinking of the possibilities. But even I know I have too much of a good thing. I have sold some of it and there is an idea running inside my head of doing a KonMari on the lot and bagging some of it up to sell at a craft show. I believe this is the year I will make that idea into a real thing. The craft show is already in the planning stages in my head. Having this much fiber has also changed the way I will run my business. I am going to concentrate a great deal more on my Ready to Ship section so I will be buying only the fiber I need for those custom and made to order fibers. Right now, most of the shop is made to order and this year, I hope to make at least 25% of it Ready to Ship. That satisfies on several levels: I won’t be buried in made to order orders and I will be able to use some of the yarn that has been looking at me from their cages. They will fulfill their destiny and become objects of art and usefulness. Isn’t that what we all want from life?